I hadn't had time to make anything in it, but we thought that Easter would be the perfect time to test it out. And let me tell you, this little clay vessel can cook a mean stew. The lamb practically melted in our mouths. 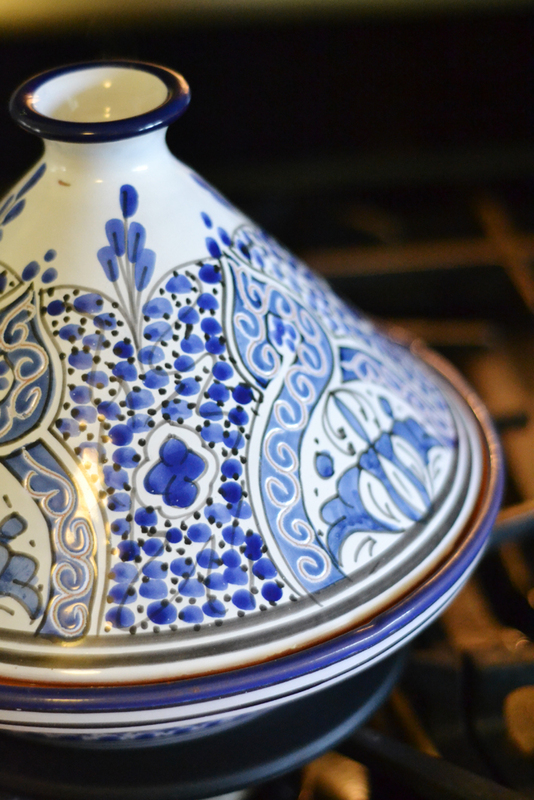 According to the Moroccan cookbook that my husband also gave me, you can create a tagine (which also can mean the stew) in a dutch oven or pot with a heavy lid, but dutch ovens can't beat a traditional tagine's beauty--it brought a certain elegance to our table that is often missing with a four year old and an 11 month old. 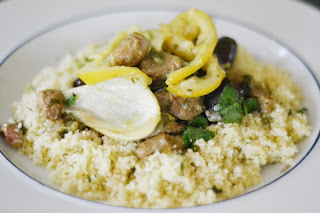 I served this tagine with a traditional bed of couscous and some Moroccan carrots on the side. (I'll post about these later this week.) This is definitely a time consuming, if simple, dish to make, so plan accordingly--but I'll be looking for every excuse I can to use this special birthday gift! 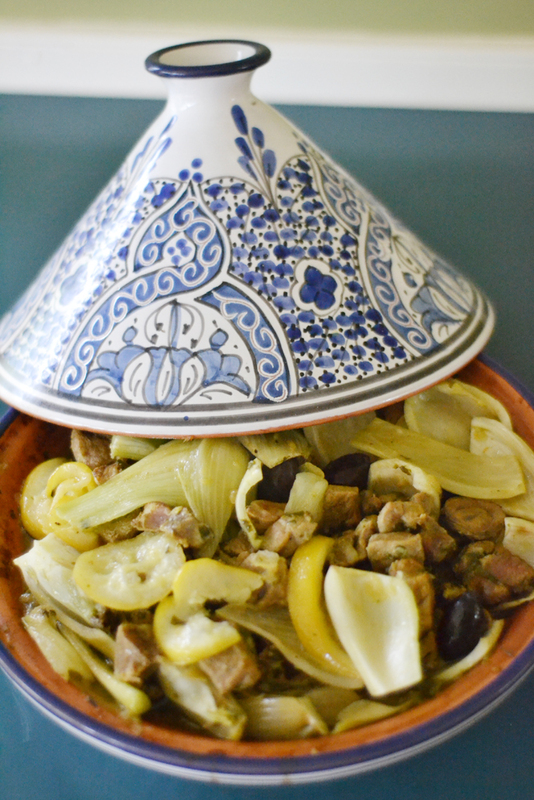 In the base of a tagine or a dutch oven, heat the olive oil over medium-high heat. 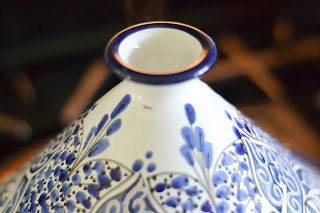 (If using a tagine, make sure to use a diffuser.) Saute the onions until translucent. Add the salt, pepper, ginger, saffron and turmeric and stir for one minute. Add the lamb, garlic, cilantro and one cup of water and stir well. Bring to a boil. Reduce the heat, cover, and simmer over medium to low heat (keep at just a simmer) for 1 1/2 hours. Stir every so often and add water if necessary. Trim the tops off of the fennel bulbs and quarter them lengthwise. Cut into 1-2 inch pieces. Add to the lamb after it has cooked 1 1/2 hours. Cook, covered, for 10 minutes. 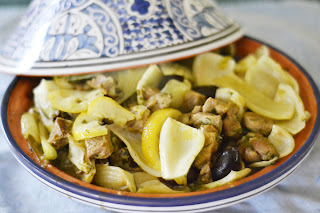 Add the lemons, olives and lemon juice and stir well. Cook, covered, for another 10 minutes or until the fennel is tender. Taste and add salt or pepper to taste. Serve in the tagine or in a large bowl with couscous. Serve hot. Although my 11 month old doesn't understand the concept of an elegant Easter dinner, he sure did enjoy it! That tagine is gorgeous! Your husband definitely knows your style very well! This Easter dinner sounds really delicious too! 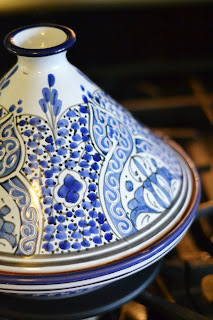 I've wanted one of these cooking vessels since I lived in France. This looks delicious. However we don't like lamb. Do you think we could make this with beef? Shannon Marie, I think you can make it with whatever cut of meat you'd like. :-) I've seen several recipes for chicken as well. I think our next adventure will be with chicken. It's great for tough cuts as it tenderizes as it cooks.